VANCOUVER, BC, January 23, 2014 — Mirasol Resources Ltd. (TSX-V: MRZ, Frankfurt: M8R) Mirasol Resources recently completed an aggressive exploration program at its 100%-owned 36,721 hectare La Curva gold project in southern Argentina, where four gold silver prospects — Cerro Chato, Loma Arthur, Southwest and Curva West — have been identified. Mirasol’s exploration suggests that the La Curva project may be part of a newly recognized, large, low sulphidation precious metal district (Figure 1) within the prolific Deseado epithermal province, which may extend to include mineralization at Las Calandrias dome field held by Mariana Resources. The geological setting of the La Curva project is prospective for bulk-mineable breccia/sheeted veinlet, and high-grade epithermal vein styles of mineralization. The four La Curva prospects are defined by large geophysical IP anomalies with coincident rock chip float and outcrop assays from a range of mineralization styles including breccias with assays up to 5.24 grams per tonne (g/t) Au and 1.2 g/t Ag, stockwork and veinlets to 24.73 g/t Au and 18.0 g/t Ag and sub-metre wide epithermal veins with assays to 66.8 g/t Au and 20.2 g/t Ag. Mirasol is currently analyzing data from the recent program which includes 57 sq. km of geological mapping, 630 surface rock chip samples and over 108 line km of pole – dipole IP and 77.26 sq. km of ground magnetics. This data is being used to define drill targets at the La Curva prospects prior to seeking a joint venture partner to drill test and further advance the project. 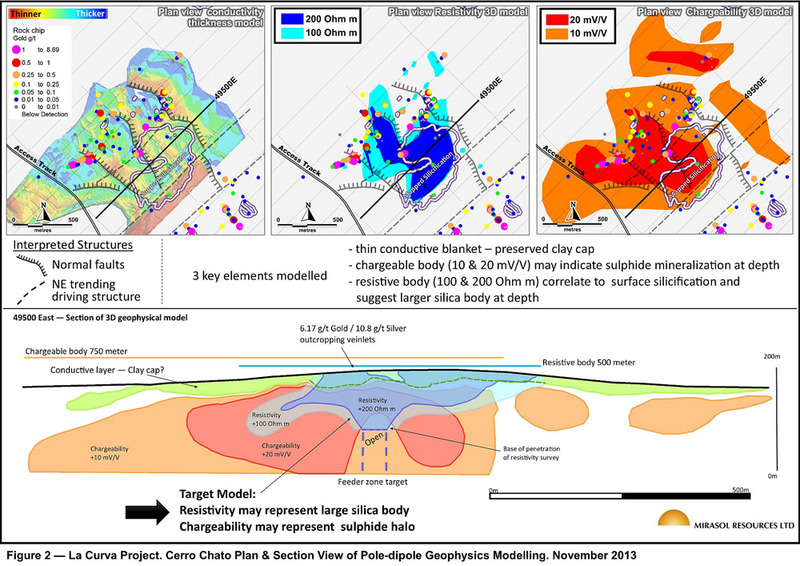 The geological setting of the La Curva project (Figure 1) and results from the Cerro Chato prospect rock chip sampling, geological mapping and modeling of the pole-dipole IP geophysical survey, have defined a series of high priority drill targets. Project scale geological mapping at La Curva has demonstrated that mineralization is localized along the margin of a regional scale block of older Permian and Triassic age rocks in faulted contact with the younger Jurassic age volcanics hosting gold and silver exploration targets. Mineralization at several of the prospects shows a spatial association with altered dikes and volcanic flow domes developed at the faulted margin of the basement block, as at Curva West, or within large scale northeast-trending cross-faults as at the 6 km long La Castora gold trend which hosts the Cerro Chato, Loma Arthur and Southwest prospects. Mapping at Cerro Chato has outlined a 1,700 m by 1,000 m argillic-silica alteration zone centered on a low, rounded hill, surrounded by thin gravel cover. The core of the hill is marked by a 670 m by 450 m zone of silica replacement of a laminated volcanic rock and associated sinter deposits. These geological features suggest the current outcrop level may be the top of the epithermal alteration system, with the potential for preservation of the complete mineral system below surface. Rock chip sampling across the Cerro Chato hill (Figure 2) has returned Au and Ag assays as follows: 1) from 20 to 30 cm wide, banded, epithermal vein float grading up to 6.8 g/t Au and 18.3 g/t Ag; 2) from 1 to 5 cm wide outcropping banded veinlets grading to 8.69 g/t Au and 5.6 g/t Ag and 3), from silicified breccia float up to 2.19 g/t Au and 5.3 g/t Ag. The occurrence of the Au-Ag bearing structures across the hill suggests the presence of a large, well mineralized system at Cerro Chato. The presence of gold-silver veinlets cutting across the silicified volcanics suggests they may have acted as a “cap rock”, potentially concealing mineralization at shallow depth beneath the hill. Cerro Chato was surveyed as part of a large 67.2 line km pole – dipole IP geophysical survey covering the 6 km long La Castora gold trend. Results over Cerro Chato (Figure 2) outline a 2,100 m by 1,200 m chargeability anomaly (+ 10 mV/V) underlying the Chato hill and extending out under gravel cover. Additionally, the survey outlined a 1,000 m by 650 m resistive body (+ 200 ohm-m) centered under the hill and coincident with the core of the stronger (+20 mV/V) chargeability anomaly. 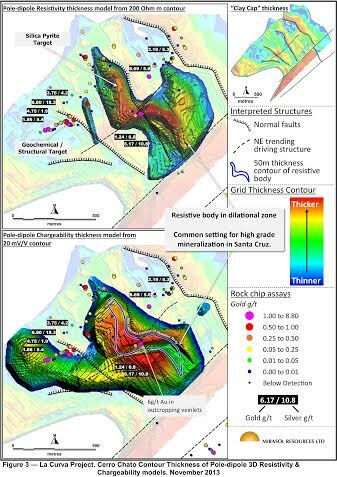 Chargeability and resistivity anomalies of this magnitude can indicate sulphide and silica bodies, and may potentially represent zones of hydrothermal alteration and mineralization underlying the Cerro Chato hill at shallow depths. Modelling of the electrical geophysical results in three dimensions (3D, Figure 3) have outlined chargeable (+20 mV/V) and resistive bodies (+200 ohm-m). These models were then represented as thickness contours (Figures 2 and 3), to allow analysis of the relationship shape of bodies to the rock chip for drill targeting. This process showed the resistivity anomaly has the shape of a +500 m long “S” shaped body, with a funnel-shaped cross section. The top of the resistivity anomaly overlaps the outcropping mapped, silicification, and encompasses areas of rock chip sampling of veinlets carrying up to 6.17 g/t Au and 10.8 g/t Ag. These veinlets, while volumetrically small at surface, may represent geochemical leakage from underlying mineralization. The “S” shape from of the resistivity anomaly is consistent with that of a northwest trending dilational structure, a shear setting characteristic of much of the significant mineralization in Santa Cruz province. Mirasol Resources has identified a highly prospective, large scale undrilled gold target at Cerro Chato that is supported by a prospective geological setting, wide spread indications of gold and silver mineralization, and near surface, large scale coincident geophysical anomalies. The combined features of this target suggest potential for both high grade veins, as well as larger scale bulk mineable mineralization. 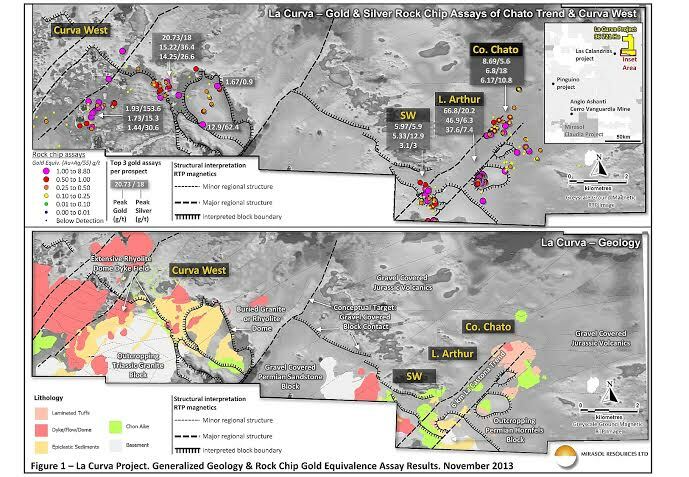 Cerro Chato is only one of four prospective precious metals prospects at the La Curva project, that combined highlight this property as one of the premier undrilled gold projects in the province. Further news releases will follow as final data is received, analyzed and targeted for the Loma Arthur, Southwest and Curva West gold prospects at La Curva. Mirasol Resources is actively seeking a JV partner to drill test the known prospects and further explore the La Curva project. Stephen C. Nano, Vice President of Exploration for Mirasol, is the Qualified Person under NI 43-101 who has prepared and approves the technical content of this news release. Exploration at the La Curva Project is supervised by Stephen C. Nano, Vice President of Exploration, who is the Qualified Person under NI 43-101. All technical information for the Company’s projects is obtained and reported under a formal quality assurance and quality control (QA/QC) program. All drill, rock chip and stream sediment samples are collected under the supervision of Company geologists in accordance with standard industry practice. Samples are dispatched via commercial transport to an ISO 9001:2000-accredited laboratory in Argentina for analysis. All rock chip and drill samples are submitted to the Laboratory with independently sourced, accredited standards and blanks and where appropriate duplicate samples to facilitate monitoring of laboratory performance. Certified Results are examined by an independent qualified consultant to ensure laboratory performance meets required standards.